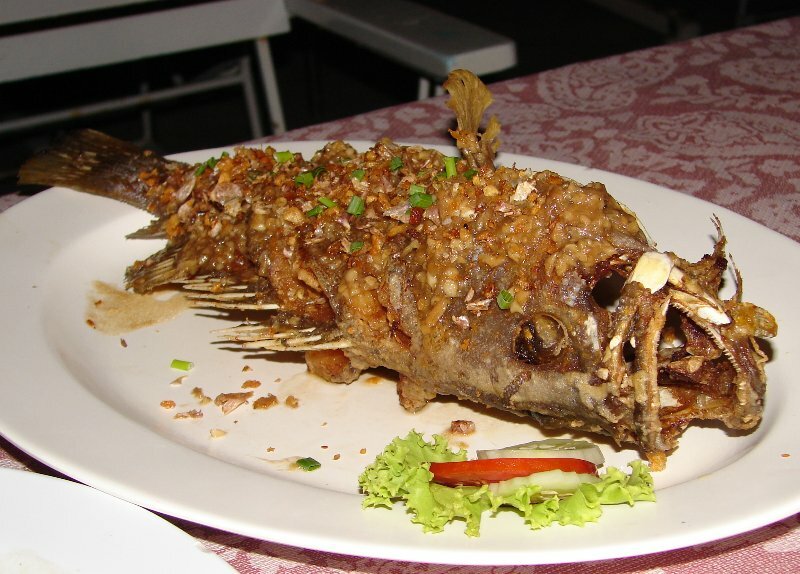 To a westerner this dish may not look too appetizing as we tend to cut the head off and fillet the fish before cooking and absolutely before serving, but never judge a fish by it’s parts. The first time I had this dish placed on the table in front of me I was none to happy. I don’t care for fish too much and seeing one in this state didn’t help to change my mind…but the first bite sure did. Cooking the fish whole keeps the flesh juicy and very succulent. The fish literally falls off the bone with a light fork. 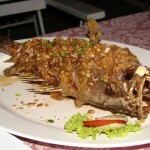 The fish is coated with flour and then deep fried, afterwards the garlic sauce is put on. Usually it is served with green and red peper as well but on the occasion of the picture it wasn’t. I really don’t care for fish but this dish tastes absolutely amazing. If you ever get the chance make sure you give it a try…it will make you a believer. I have included the recipe below if you feel inclined to give it a try in your kitchen. Cut three slashes to the bone on either side of the fish, then coat with flour on both sides. This will prevent it from sticking to the skillet and make the fish crisp. Heat the oil in a skillet or a wok to 350 degrees. Carefully lay the fish in the oil and deep fry each side for 5 minutes. Remove from the oil and set on large plate. Heat a medium skillet on medium-high heat, then add the oil and blended sauce ingredients. Stir and cook for 3 minutes. Add fresh fish sauce, sugar, lime juice, and pepper and cook for a further 2 minutes. Stir in the lime leaves and the basil. I love fish esp steamed ones. I have tasted something like this over here and they are good too! I have to admit I like fish more now that I’ve had quite a few fish dishes in SEA. Steamed, fried, and bbq’d mmmm. Actually I look delicious.I’ve made something similar except I make a sweet and sour sauce.I also use Red snapper(whole w/head on).My friends actually love it.Great recipe I’m going to try it. I’ve eaten this dish before and it’s absolutely delicious! Yes, don’t judge a book by its cover is very apt here.